DONNIE Brasco is a gem of a film that is often overlooked when people discuss their favourite Mafia movies. Inishowen is a gem of a location that is often overlooked when people discuss their favourite festivals. When the chance came up to attend a brand new festival (a celebration of music, art, comedy, food and literature) in the grounds of an historic old mansion in Moville, my interest was instantly piqued. Entry to the Jewel Box Festival at Carnagarve House on Saturday was by way of a €20 donation. Having regularly walked past this old building on the shores of Lough Foyle for 13 years, I thought, 'I'd give €20 just for a look inside...and anything else will be a bonus'. I suppose I could have asked for a media pass but then it would have been a work night and I didn't want it to be a work night. Carnagarve House is a beautiful, late-Georgian building (circa 1825) with a domed glass conservatory which has held a fascination for people for decades - all the more so because, despite being tantalisingly close to the shore path, it has been off limits for decades. 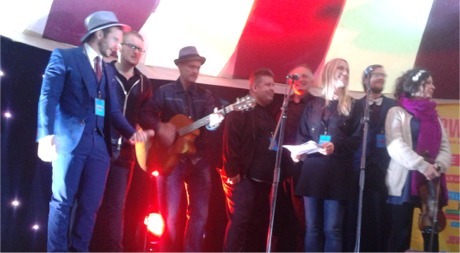 Festival acts take to the stage to perform 'With a Little Help from My Friends'. We couldn't make the 4pm festival start, so like many others, we missed some great local acts like the Moville Gospel Choir, Spring Tides, Broken Hearted Horses, Leo McCauley and Sean Hiboy. We also missed most of the cookery demonstrations but got to taste some fabulous barbecued lamb and salsa verde at the last demo. *Note to self - salsa verde, in all its green, herby glory, is probably not recommended when you have braces on your teeth and forget to bring an interdental brush. When we arrived shortly after 7pm, there was a nice buzz about the place and the first thing we did was go inside the old house. There was an art exhibition inside but the house is so beautiful (even in its current, disused state); and the evening light and panoramic view over Lough Foyle so stunning, the house and its original features was a gallery in itself. The immediate grounds of the house - essentially a large walled garden - provided a secluded, intimate feel to the festival with its myriad tents and marquees. We heard Swedish folk artist Klara Kjellen and Derry singer-songwriter William Carson's set. Festival organiser Sarah McGuinness throwing percussive little egg-shakers into the crowd during her set, was a nice, inclusive touch which followed through to the rest of the evening. Just as we were all getting a little too comfortable in our surroundings, British comedian Luisa Omielan (described as "one of the stand-up hits of the decade") burst onto the stage to shake things up. She gave festival-going parents a heads-up of what was to come "mother******s", but some people were well caught out and had to swiftly exit the tent with their children in tow as Omielan got into her stride. They probably had to cover their kids' ears outside the tent too as the expletives bounced like flat stones across Lough Foyle. What followed in Omielan's set was an hilarious adult-themed routine exploring pop culture and its obsession with the body beautiful. A particularly funny segment focused on the power of female genitalia and how Omielan's had been known to empower previously bland ex-boyfriends to superhuman endeavour - you could say it was all about lady gardens in the walled garden. Pulling her trousers down to celebrate her lack of a 'thigh-gap' added no small measure of shock value as the energetic comic gave two fingers to a culture increasingly obsessed with bodily perfection. The 4 of Us on stage at the Jewel Box Festival. The headline act, the veteran troubadours The 4 of Us, were simply superb. 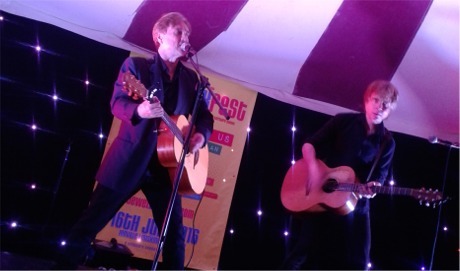 The Newry brothers, Brendan and Declan Murphy, performed a brilliant set that was both familiar and intimate yet got the tent rocking from the get go. The band delivered a powerhouse performance, honed to perfection over many years, that seemed to defy the fact that it was just two men with two guitars (and a few effects) onstage. A modest fireworks display - set against the backdrop of a Foyle moonset - was another unexpected turn from the festival organisers. The Jewel Box Festival lived up to its name - plenty of gems along with the excitement of not knowing what will be plucked out of the box next. And so I circuitously return to Donnie Brasco. One of the early scenes in the 1997 movie has Johnny Depp - an undercover FBI agent trying to infiltrate the mafia - being shown a diamond ring by the mafioso 'Lefty', played by Al Pacino. The question is, is the gem a 'fugazi' (a fake) or is it the real thing. The organisers of the fledgling Jewel Box Festival on the shores of Lough Foyle have a long way to go in their ambition to organically grow it into an iconic, independent cultural event. From its first outing, however, it appears the ambition is honestly-held and as authentic as Carnagarve House itself. The Jewel Box Festival is no fugazi.